A biome is a region of vegetation and the associated animal community that has developed in response to climatic and other abiotic factors such as temperature, precipitation such as rainfall, and latitude. Biomes that occur at lower latitudes are warmer and wetter than those at higher latitudes, showing the strong influence of latitude. Biomes are very large areas of vegetation that include several living organisms making up various different ecosystems. There is almost always more than one ecosystem to be found in a single biome. A biome is actually the largest biotic unit that can be found on the earth, and can cover a significant portion of a continent. 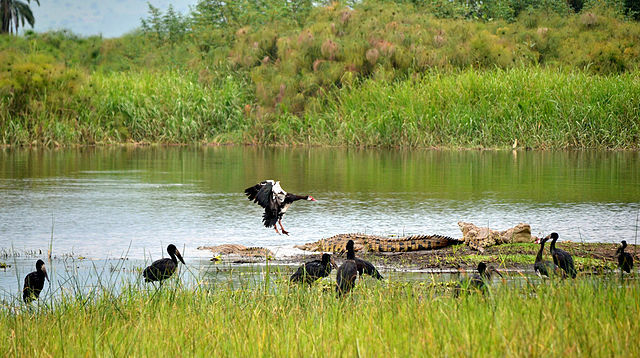 Animal life will vary in accordance with the vegetation and climatic conditions and will include many more species and numbers of animals than would occur in a single ecosystem. There are still distinct animals that one may find in a particular biome. For example, gorillas are only found in the rainforest biome and giraffes are only found in the savanna biome. There will be trophic levels in the sense that there will be primary producers, plants; and consumers, animals. The number of food webs in an entire biome would be much greater than in an ecosystem since a biome by its definition encompasses a much larger area and includes more than one ecosystem. For example you would find specific aquatic and terrestrial types of ecosystems in the Amazon rainforest; for example, you could have an Amazon River ecosystem and an ecosystem in one specific region of the Amazon forest which encompasses the trees and soil and all associated organisms. An example of a biome is the tropical rainforest which occurs within 30 degrees north and south of the equator. The savanna biome is also within this latitudinal zone. At higher latitudes where conditions are colder, you would find coniferous forests while at still higher latitudes you would find the taiga and tundra biomes. An ecosystem is the group of plants, animals and environmental factors that all interact with each other in a specific area. Individuals that make up an ecosystem interact through trophic interactions, food chains, and food webs. Soil and water can also be part of ecosystems since they provide nutrients, minerals, and habitat for organisms. An ecosystem, therefore, includes these environmental factors and all the organisms that interact with these factors and each other. An ecosystem does not consist of as large an area as a biome, although it often contains many species that interact with each other. Several ecosystems can be found within a biome. An ecosystem is not determined by area so much as by the interactions of organisms. There would be less species of animals in a single ecosystem compared with a biome. However, the animals would all interact with each other in an ecosystem. They would form trophic levels in food chains. Trophic levels are important in an ecosystem. Often members of the ecosystem interact through food chains and food webs, with one species feeding on another. Nutrients and energy are thus passed along through the ecosystem in this manner. Primary producers are the plants that use sunlight to form sugars in photosynthesis. An animal, a primary consumer, then feeds on the plant, taking in the food and energy. A second animal, a secondary consumer then feeds on the first animal. This continues until the top of the food chain where the top predator is. Examples of ecosystems are coral reef ecosystems, a Mississippi river ecosystem and a Gulf of Mexico ecosystem. In South Africa, there are Cape fynbos ecosystems. A biome is a large biotic unit that consists of vegetation and animal life that has developed in response to abiotic factors of precipitation, temperature, and latitude. An ecosystem is all the plants, animals and environmental factors that interact within a certain area. A biome is strongly influenced by climatic factors such as rainfall, snow, ice, temperature; while an ecosystem is not strongly influenced by such factors. A biome is influenced specifically by latitude while an ecosystem is not specifically influenced by latitude. A biome is a very large area of biotic life, while an ecosystem is a much smaller area. Animal species that are found in a biome do not all necessarily have to interact, while in an ecosystem, animal species do all interact in trophic interactions of food chains and food webs. Examples of biomes include tropical rainforests, savanna, and coniferous forests; while examples of ecosystems include for example coral reef ecosystem, Gulf of Mexico ecosystem and Cape fynbos ecosystem. 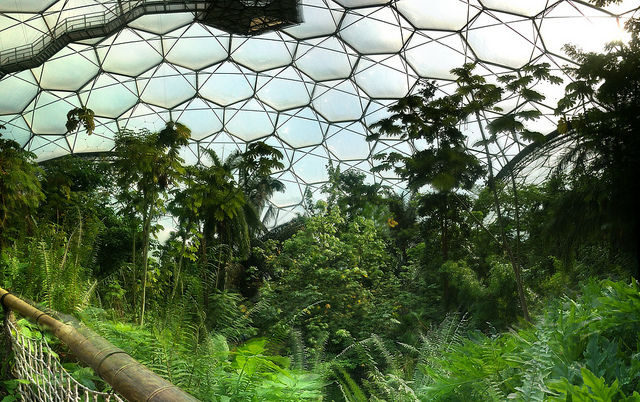 Biomes and ecosystems both contain plants, animals, and environmental factors; however biomes are much larger areas that can include several ecosystems. Biomes are determined by climatic factors such as temperature, precipitation, and latitude. Ecosystems are defined by the interaction of organisms in trophic interactions, rather than by the climatic factors of an area. Ecosystems consist of food chains and food webs in which the organisms interact by feeding on each other. Dr. Rae Osborn. 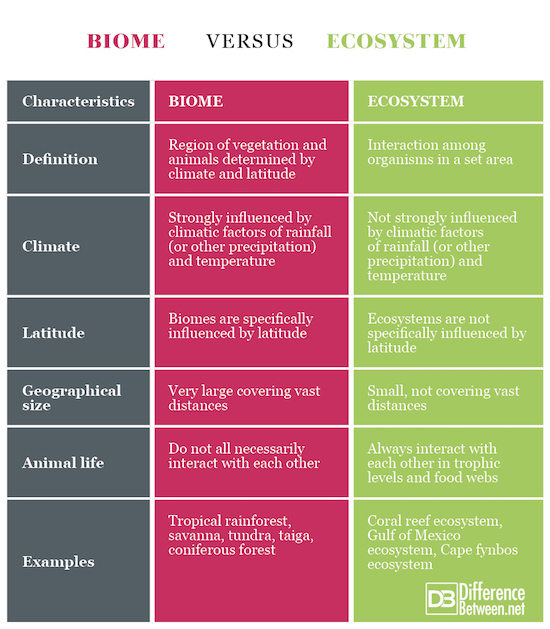 "Difference Between Biome and Ecosystem." DifferenceBetween.net. January 31, 2019 < http://www.differencebetween.net/science/nature/difference-between-biome-and-ecosystem/ >. Editors of Encyclopedia Britannica. “Biome”Science. Encyclopedia Britannica, 2018, https://www.britannica.com/science/biome.